What is a work of art if not just that, a work. It is the culmination of mental and manual processes whose labour conjoin to produce it. Ideally, the artwork is open enough to allow audiences to actively contribute to its meaning. Thus, the audience supplies some of their own labour to the artistic process. However, what is a work of art before it has been recognised as such? Is it just raw material? This question is more complex than it sounds, for what is the line that ultimately separates a bone-fide artwork from the common world of non-art objects? And besides, when is a work of art ever truly finished, how unfinished can an artwork be before being dismissed as mere ‘stuff’? 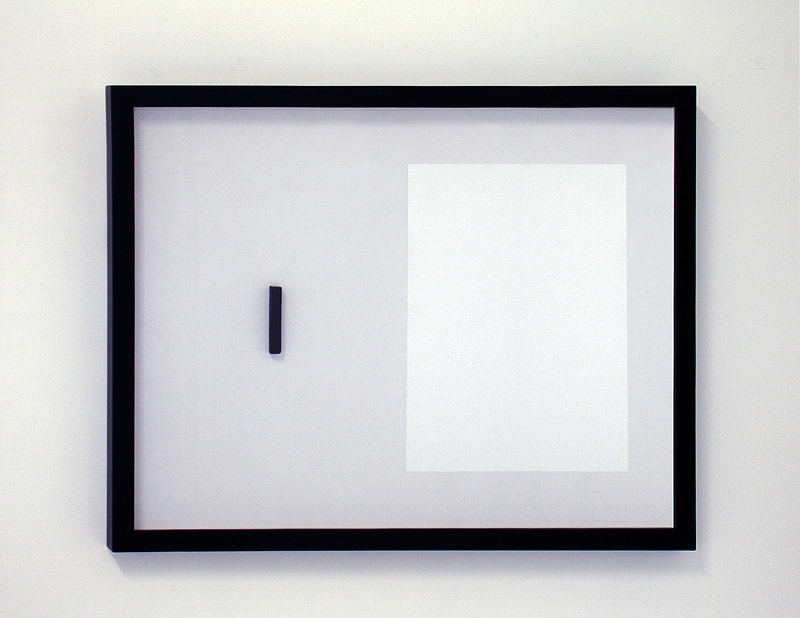 ‘Contract’ poses such questions by presenting the prima-materia of art as the ‘finished’ art work. Entombed within its frame, the work of art yet-to-be is offered to the audience, not so much to symbolically complete, but to effectively start from scratch. At the same time, as the audience is forever physically locked out, the materials on show begin to function as museological artifacts or found objects. In fact, ‘Contract’ challenges the presumed unpremeditated ‘indifference’ of the Duchampian found object: even some of Duchamp’s found objects existed in sketched or pre-notated form. Alternatively in this instance, the lump of charcoal and piece of plain paper suggest their priority over the found-object-to-come by transforming the most basic unaltered physical interface into the idea.